Democracy means voters choose their politicians. Current Pennsylvania law lets politicians choose their voters. Legislators work behind the scenes with no oversight or standards for fairness. They use mapping technology and big data to profile voters, and use that information to pick exactly who they want in or out of a voting district. They accept money from parties, super PACs, and outside interests, which all target PA because we are a populous swing state with lax campaign finance laws. They can and do draw whatever boundaries will maximize their influence, minimize their accountability, and keep their seats in office secure. The current process is redistricting gone wrong—a process driven by partisan politics, mapping technology, big data, and outside money. The result is gerrymandering: the practice of manipulating voting districts to benefit parties, not people. Your vote counts less. Gerrymandering means politicians listen to party leaders and pressure from outside interests, rather than the people. 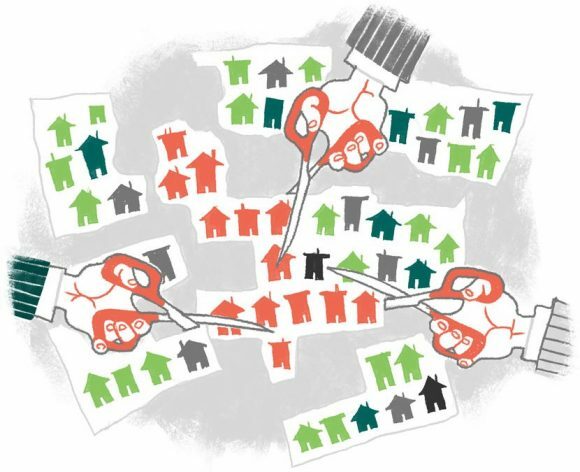 Gerrymandering uses techniques like “packing” and “cracking” to target voters from a particular group, such as voters from the opposite party or minority or low-income voters, to reduce their influence. We get fewer options at the ballot box. Competitive elections keep politicians accountable. But in the 2016 general election, incumbents ran unopposed in almost half of PA House and Senate races. Many voters feel understandably frustrated, so they disengage—which adds to the vicious cycle of unaccountability. Politicians lose civility and can’t solve problems. When districts are designed to protect incumbents, new faces and new voices are kept out of office or discouraged from running at all, and those in office feel no need to play nice. There are lots of important problems we simply can’t fix if we don’t have a functional democracy. Consider Pennsylvania’s 7th Congressional District. Sixty years ago, it was a compact, logical shape. Until 2018, when the PA Supreme Court declared the 2011 district maps an unconstitutional gerrymander, it was a squiggle of lines contorting its way from Plymouth Meeting north of Philadelphia down to Kennett Square in Chester County, and then all the way over to parts of Lancaster County. (Its nickname: “Goofy kicking Donald.”) This was not a fair voting district. The Supreme Court decision didn’t solve the problem, however. It covered only the federal congressional districts, not the state legislative districts, and in any case Pennsylvania’s districts are likely to be gerrymandered again after the 2020 U.S. Census, when the maps will have to be redrawn again. Unless things change, wherever you live in Pennsylvania, you’re going to be affected by gerrymandering. Even well-meaning politicians can’t do their jobs: They can’t represent spread-out communities with different needs and priorities, effectively maintain offices across wide geographic areas, or do the real work of governing: solving problems that affect us all. Gerrymandering also allows outside money and influence to control parties’ agendas, and makes it easier for extremists to gain control of the party. 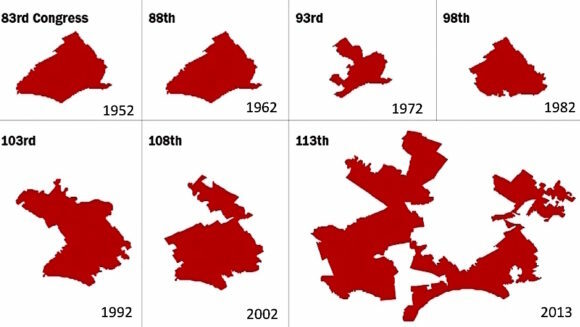 Gerrymandering is a tough problem, but we have a solution—and the momentum to make it happen. State legislators have proposed new bills in both the House and Senate that would establish an independent citizens commission charged with drawing fair district lines that reflect real communities and are free from partisan and financial influence. Now we need your help to turn these bills into law.